The plan will be that Heidi Rasmussen’s triplets will today be removed and placed in three different foster homes. But the desperate mother is always hopeful that the authorities will think again and put the process on hold. – It hurts. I still hope that the Appeals Board contacts my lawyer and says the case should be rolled back. So there may be more cards on the table. It means that the case is not properly illuminated, says Heidi Rasmussen. 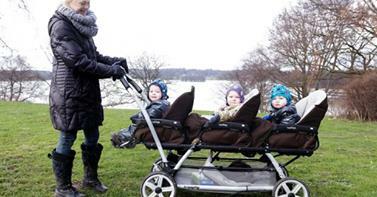 Kalundborg Municipality has decided to remove the triplets from the 39-year-old mother and put them in different foster homes. The municipality has estimated that Heidi Rasmussen is currently not able to take care of her children, who are very demanding in treatment. Although she says that she just needs help with practical tasks, which she previously unsuccessfully asked the municipality for, long before the care of the triplets was problematic. – There is no urgent need for them to be removed from the mother now. Therefore, we have found a place where the mother and the three children can be until the case is permanently resolved. We expect that the Appeals Board gives us answers to today, says Heidi Rasmussen’s attorney, Donald Well Tved.